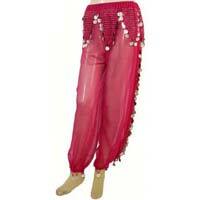 Based in Delhi, India, we are a high flying manufacturer, exporter and supplier of Belly Dance Trousers. We are highly appreciated by our customers for supplying them with a unique collection of Belly Dance Trousers that too in innumerable colours, designs and patterns. We offer these trousers at the most competitive prices. All our products are well-checked by our quality experts before dispatching. In addition to this, we offer timely delivery and with the best packaging options.